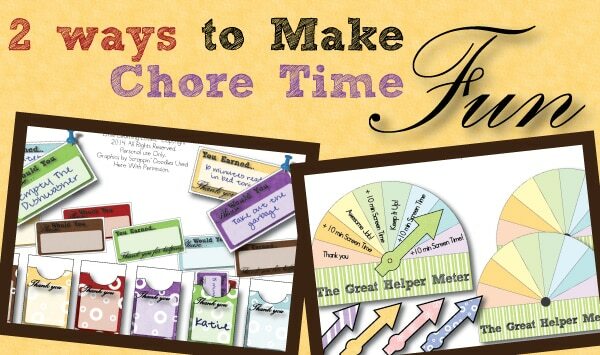 » Chore Systems 2 Ways… Fun Motivation for You AND Your Kids! I have 2 big ideas for you today! I’ve noticed that mixing up the chore routine really helps keep everyone motivated (including me!) so if you already have a chore system going, you might want to use one of these new chore system options for a few months and rotate back through the ideas, keeping them fresh and fun. In hindsight, I probably should have called this the “Help-o-meter” 🙂 But YOU can if you want on the blank one I included in the file. 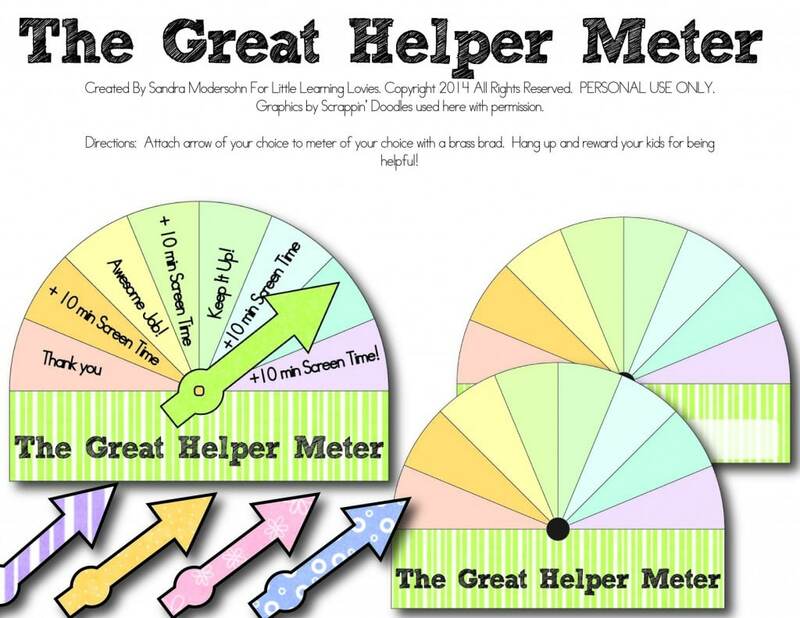 The way the Great Helper Meter Chore System works is you set it all the way to the left at the start of the day. As your child helps you throughout the day you bump the pointer up one section at a time. You can be super cool and bump it up twice if you are really impressed by their efforts! We have one that’s set up for you to award screen time (a favorite reward in our house) but we also have blank ones for YOU to fill in with the favorites in YOUR house. Fun. Simple. Immediate rewards. Great for very young children from about 2 1/2 up through 6 or 7. And we give you several pointers to choose from so you can make it perfect for your child. Whew! Something about our preview images is off here because the colors are actually much calmer than that! And easier to read! But let me tell you about THIS fun way to encourage older kids to help out. 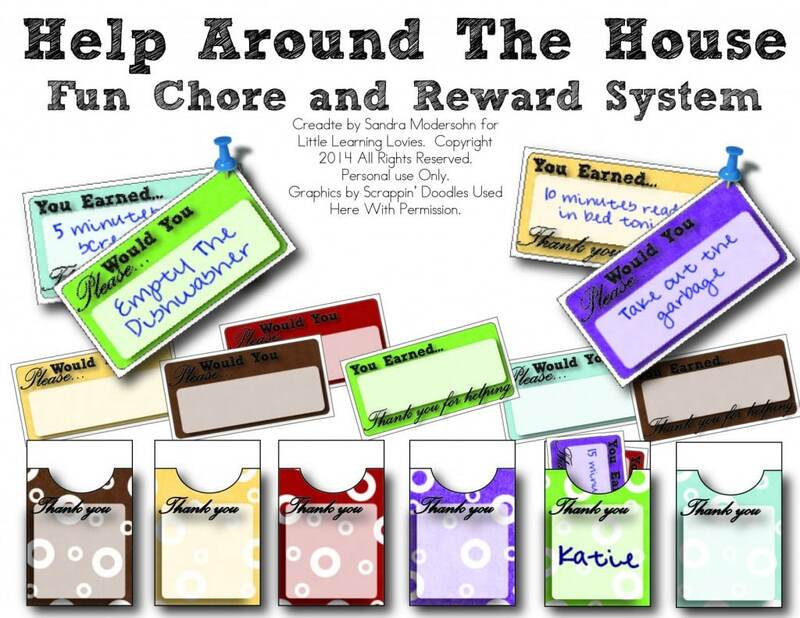 With our “Please and Thank You” Chore And Reward Card System, you look around the house and decide what needs doing. Write a “Please” card and a “reward” card. Pin them up to a bulletin board together, with the ‘Please’ on top. Under that, along the bottom of your board, you post the envelopes for each child in the house. They look over the board and decide what they’d like to do and get to it. For any “Please” they complete, they earn the reward. They bring the ‘Please’ card to you so you can check the work, and once you approve, they put the earned reward card in their envelope to redeem at the appropriate time. The “Please and Thank You” Chore Card System file includes some reward ideas. If you want, and your kids are motivated by this, you can choose to pin a little cash with the cards instead! I can see that working well for teens. Can you imagine when they walk by the board in the morning and see all the cash they could earn that day? I know it would work for me! So which of these two chore systems seem like they would work for YOUR family?